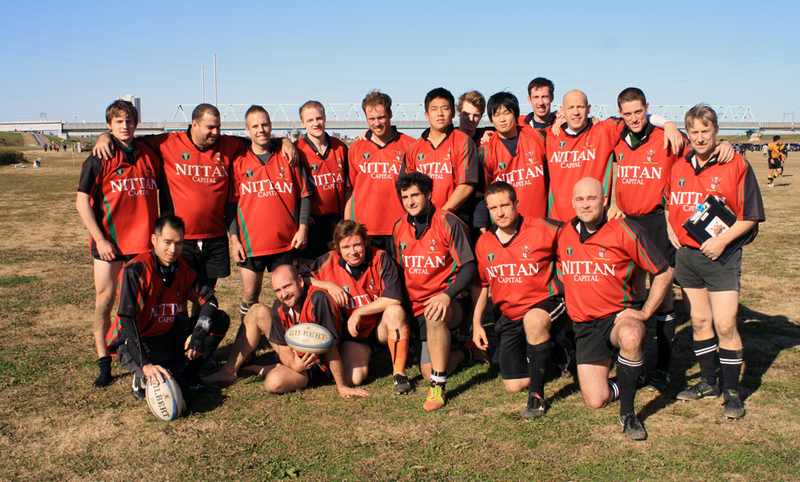 On a wind-swept but beautiful, sunny Sunday morning, 11 Crusaders gathered in the outskirts of Tokyo for the final match of 2012. A few minutes before kickoff 8 more turned up to fill out what would be a well-oiled rugby machine. Facing a determined and eager Kichijoji Wild Turkey opposition, it was a hard-fought match from the start. Lack of experience at front row meant Richard Williams and Kyle Hill stepping up in big fashion to fill the void, and I’m sure they have a lot of aches and pains to show for it. A very strong and technical Wild Turkey front row had the Crusaders scrum somewhat on the back foot for the better part of the first half before we found our rhythm. Fortunately, Tom Bombadil (aka Tom Ball) at #8 was very adept at getting the ball out in time before going on one of his many trademark rampages. Forwards then did very well getting to the breakdown and providing a stable platform for scrumhalf Neil Maclean to get the ball out to the backs. Thereafter we witnessed some superb passing through the hands of the back line, with forwards once again managing to stay in close support to provide for recycling. Travis Dixon repeated his greased-up deaf guy several times before offloading to a capable set of centres in Andrew Matyas, making a special return guest star appearance, and Gene Melvin, who was sadly playing his last game for the Cru. Melvin, you and your awesome tackling skills will be sorely missed. As the dust settled at halftime, the Cru found itself ahead by 4 points, thanks to tries scored by Greased Up Deaf Guy Travis Dixon, newcomer Takuro Suzuki and Gene ‘The Machine’ Melvin; the trusty boot of Evan Hitchman converting all three tries made the difference thus far, the scoreboard showing 21-17 to the Cru. But there was a long time yet to play and fitness would obviously be a factor going forward. Fortunately, we were rallied by Tooley’s halftime inspirational speech of “OK, who’s coming to the izakaya after the match? I need to know now.” It was an untried but clearly effective motivational technique, as we came out once again firing on all cylinders. The opposition, however, had the same idea in mind and it was a hard fought 35 minutes. I’m not aware if they discussed their post match function at halftime, but they might have. The Cru went up by 2 more tries and a conversion, but Wild Turkey was far from finished. They answered with 2 converted tries and were receiving the last kickoff with 4 minutes to play – plenty of time for them to salvage a win. But the Cru stayed resolute and held them off until the final whistle. Score Crusaders 33, Wild Turkey 31. The opposition was visibly disappointed in the result – they gave it all they had and was a hand-full. But all the efforts of the Cru this season came together and allowed us a hard-earned and well deserved win. Afterwards we headed to the neighborhood bath house, only to find it wasn’t yet open. So we and the layers of dirt we were all wearing set off toward the station, all the while keeping an eye out for a drinking venue (the izakaya idea was cancelled, believe it or not). To our great fortune, we discovered what may become a regular drinking spot for us – a 7-11 parking lot. 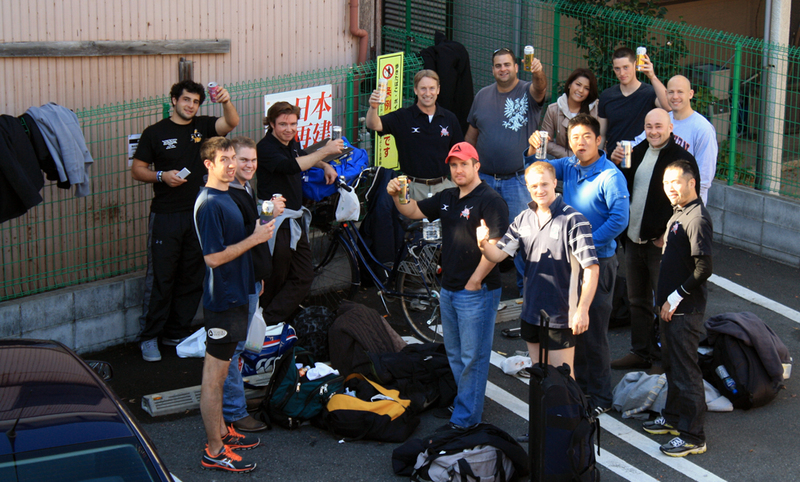 After loading up on beers, chu-hais and snacks we proceeded to make merry in the 7-11’s near-empty parking lot. During that time a 7-11 delivery truck pulled up. Mo Joy reckoned the management had called in reinforcements to deliver more beer before the shop ran out and we started to get angry. I’m going with that story as well. From there it was on to Ueno for a few more (10 or so) cheeky beers at an Irish Pub, which was a great way to kill time whilst waiting for the Hub to open. The crowd dwindled further while the diehard alcoholics relocated to the Hub. I’d like to regale you with stories from that point on, but from there my memory kind of blurs for some reason. Thanks to everyone who came out on the day and for everyone’s hard work throughout the season. It was great day out and a great evening as well. Hope to see everyone at our all-important match on January 13.